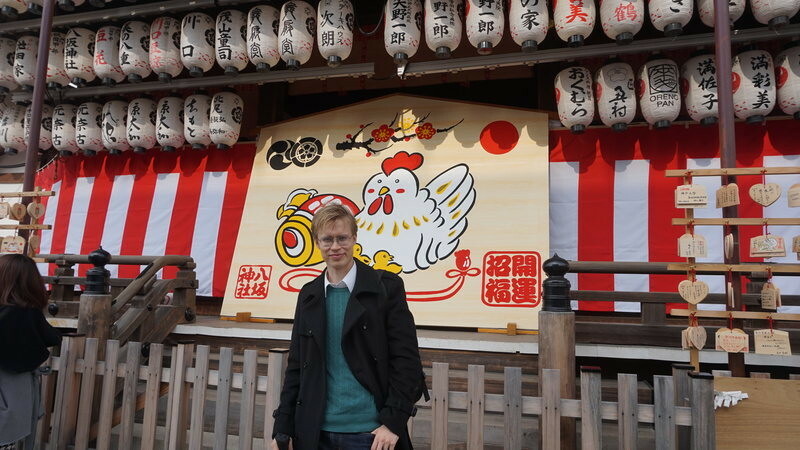 In Japan in January you need go to a shrine for the first shrine visit of the year, so of course Sharing Kyoto's writers had to go too. Hello everyone, and a happy New Year! 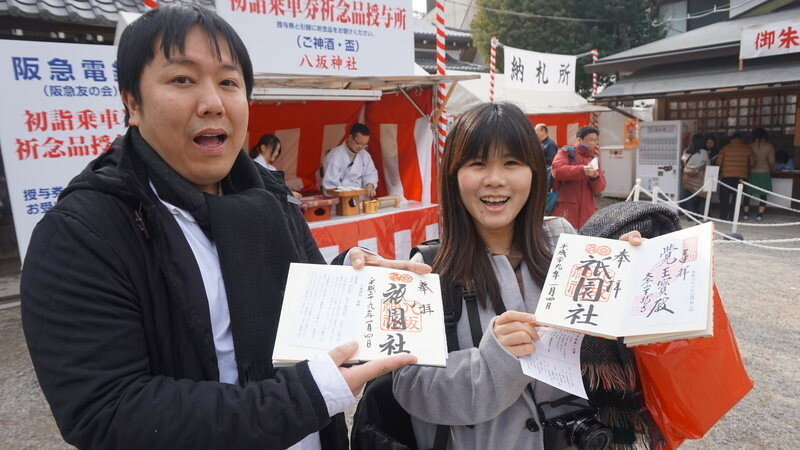 We at Sharing Kyoto promise to get you the latest news about Kyoto also in 2017, and to start our reporting for this new year we went to Yasaka Shrine(http://sharing-kyoto.com/see_Yasaka-Shrine/). 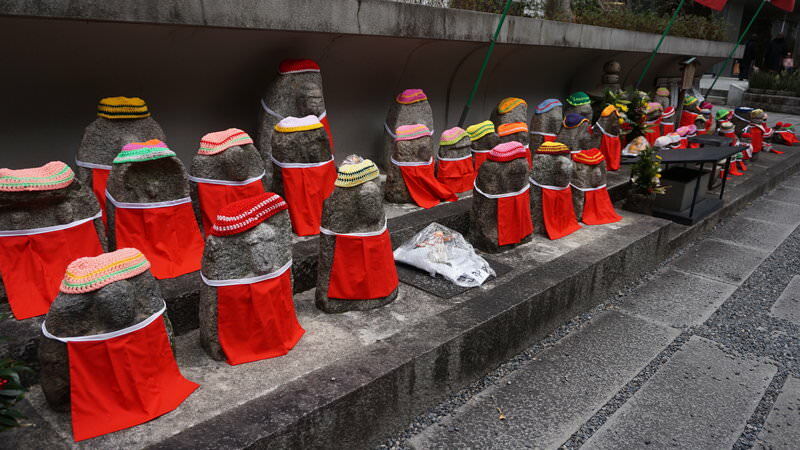 The first shrine or temple visit in Japanese is called hatsumode, and is traditionally done on the first of January. 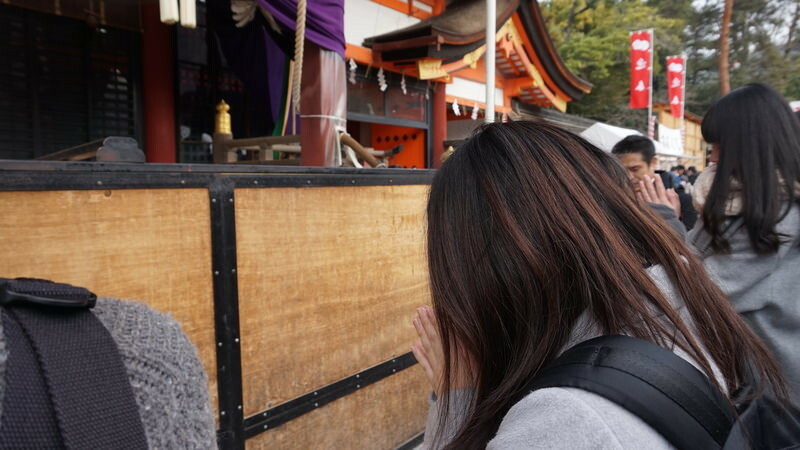 When we went to Yasaka Shrine, it was already 4th but there were still really many people visiting the shrine, so be prepared to wait if you are going to the shrines and temples of Kyoto in the beginning of January. This is us departing from our office in Karasuma. As a good omen, the weather was nice was for our first shrine visit of the year. We were heading for Yasaka Shrine which is a 20 minute walk from Karasuma. It is always fun to walk in Kyoto; you never know what kind of cozy café or curious shop you are going to find. As you can see we were not the only people going to the shrine, and it took us some to time to even get this far since there were so many people going to the shrine. The gates of the shrine are huge and dominate the view around this part of Kyoto. If you are going to Yasaka Shrine for hatsumode, it will not be difficult to find the shrine from the closest stations (Hankyu Kawaramachi or Keihan Gion Shijo) as everyone is going there. Just follow the crowd and you will eventually get to the shrine. 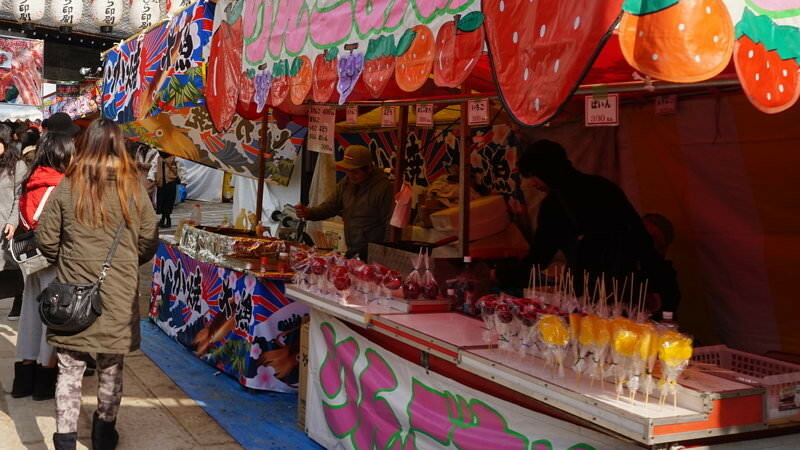 Inside the shrine there are many food stalls selling fried chicken, candy apples, and other delicious treats. It is the usual festival fare, but it is comforting to know that some things stay the same year after year. We were going to have some curry udon noodles for lunch so regrettably we didn’t get any treats this time. Here you can see Yoko symbolically purifying her body by first washing her left hand, then her right hand, and lastly her lips. 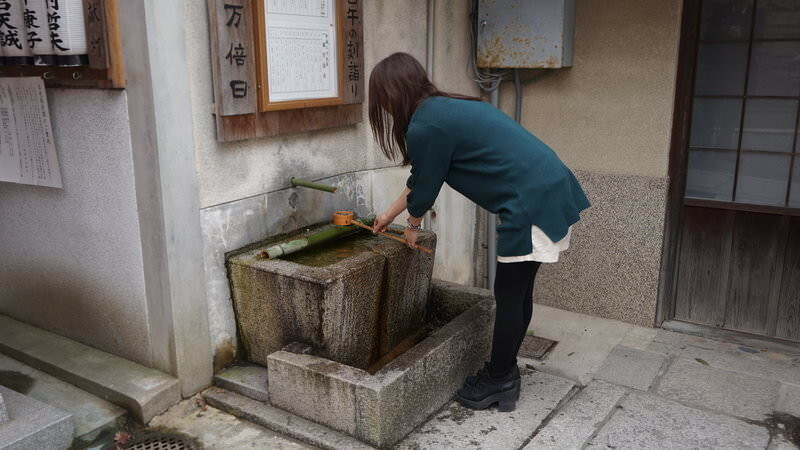 Actually you are also supposed to gargle with the water, but as there was a bug floating on it, Yoko wasn’t so keen on doing that. This is Erika wishing for a prosperous year at the main altar. The proper way of doing a hatsumode is to throw a coin first into the chest, then bow twice, clap twice, and then bow one last time. The reason for clapping is to show to the gods that you come with nothing on your hands and that you bear no ill thoughts. When throwing the coin into the offertory chest many people throw it with a bit of force so it makes a lot of noise, but this is actually frowned upon by the devout. You are supposed to throw, or let the coin fall into the chest as silently as possible. 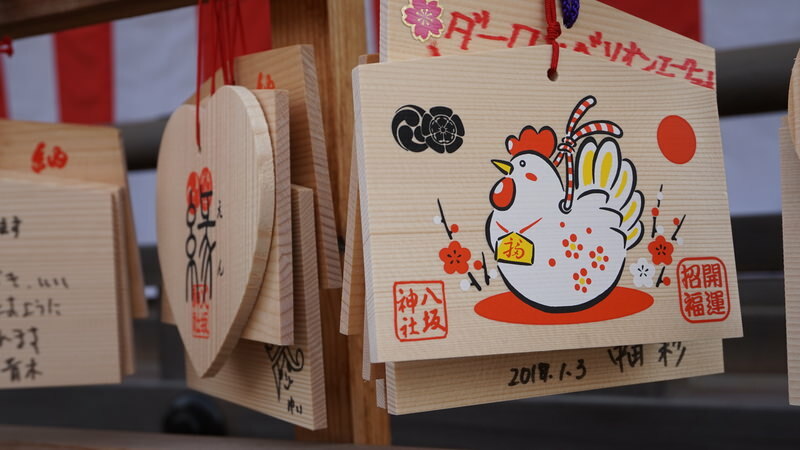 It is the year of the Rooster, and you can see that the shrine is full of wooden amulets with the Rooster in them. Though I have to say these roosters are so cute you could almost think it was the year of the hen. Of course we had to get our temple stamp books stamped. We call these books temple stamp books, but they can be stamped at both shrines and temples. At Yasaka Shrine there were really many people writing the text of the stamps and it seems like some of them had better calligraphy skills than others. As you can hopefully see in the picture, Kenji’s is written exquisitely well, whereas Erika’s has a bit of an amateur’s touch. Then it was time for the grand finale, fortune paper slips! As you can see from Erika’s expression, she does not have good luck this year. She has bad luck. Having bad luck means she has to be careful this year! 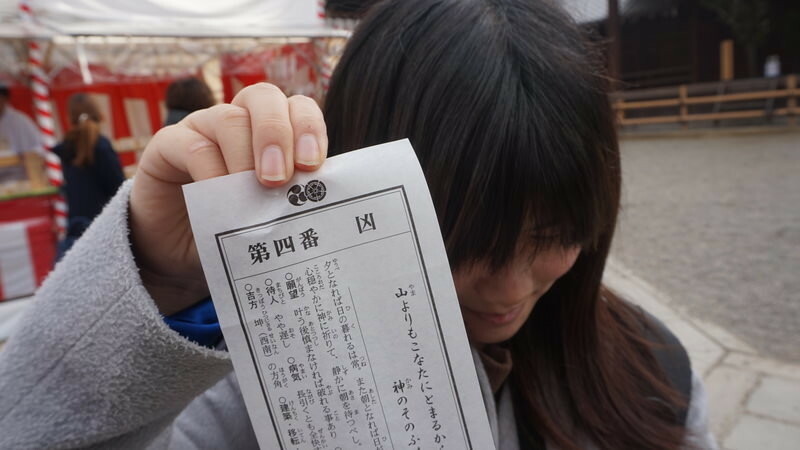 Whereas Erika had bad luck, Yoko got a paper slip saying she has exceptionally good luck. Then it was time to leave the shrine behind and go have some delicious curry udon noodles at Mimiko(http://sharing-kyoto.com/eat_Mimikou/)! Mimiko is a restaurant specializing in curry udon noodles, and their curry udon has a stronger taste than many other udon places offering curry udon noodles. 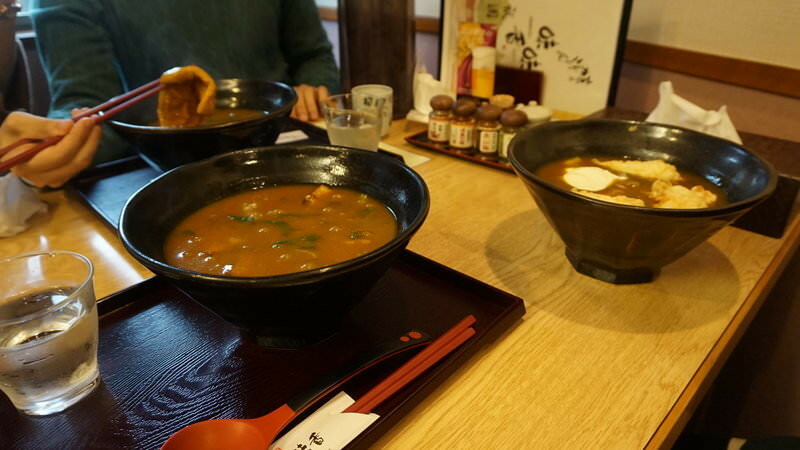 At Mimiko you can choose how strong you want your curry to taste, the choices being normal, 1.5 times normal, and double. I went with double and was pleasantly surprised at how tasteful my curry was. Even with double strength curry you won’t be breathing out fire, but you have an arsenal of spices at your disposal to make the udon hotter. It is also nice that you get a paper apron to shield you from the messiness of eating curry udon noodles. I suggest using it, as it is quite hard to get the stains of your clothes. And here are your spices. 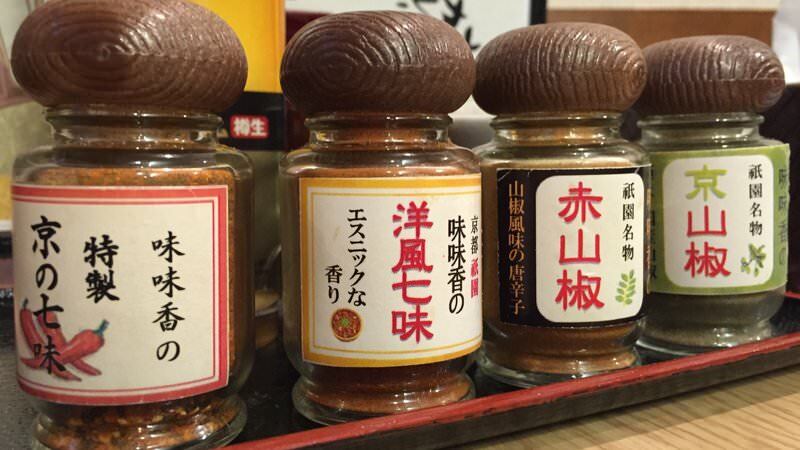 You have Kyoto style shichimi, western style shichimi, red Japanese pepper and Kyoto style Japanese pepper. Shichimi is a spice mix containing seven different ingredients. The spices all have distinct tastes and are sure to light your mouth in fire if used in abundance. My recommendation is the red Japanese pepper with western style shichimi; this combination will surely make you love the curry udon even more. This is what I had at Mimiko, ama-kitsune curry udon noodles. 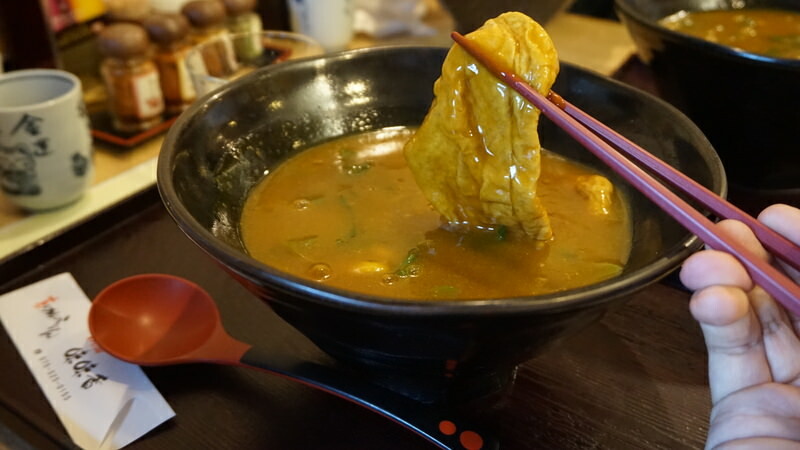 You get two pieces of sweet deep-fried tofu with your udon noodles, and this sweetness goes really well with the spiciness of the curry. The thick curry was just spectacular, I am almost certain it was the best curry udon I have ever had. Just when it was time to head back it started to rain, so we hurried back to the office. Right before we got back to the office it stopped raining so we decided to also go to Rokkakudo Temple, for our first temple visit of the year, as we just had visited a shrine. We have a video about our visit on our Facebook page, and in this video Yoko will show you how to behave in front of the temple altar. That was all for today, we hope you have a great year ahead! 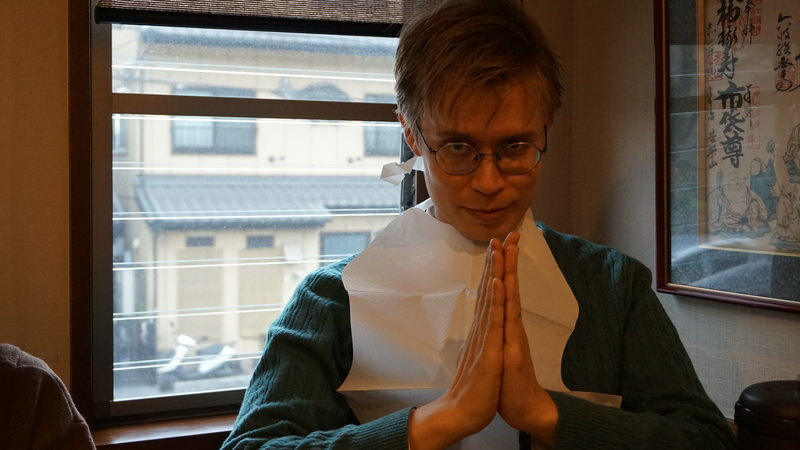 New Year in Japan means hatsumode. 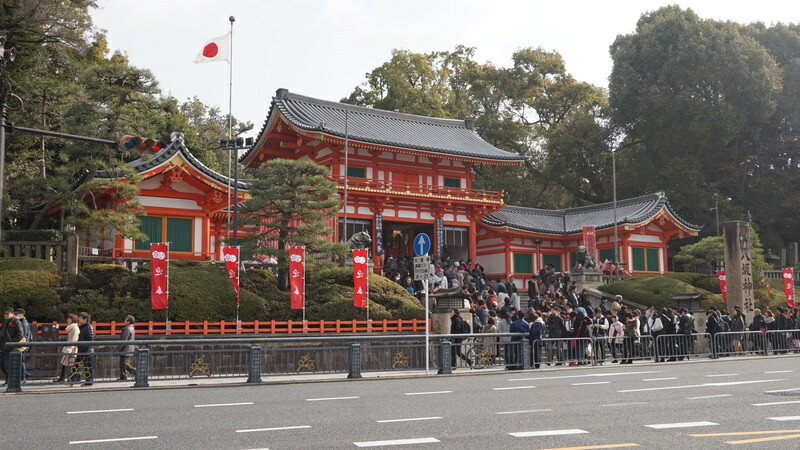 Really many people went to Yasaka Shrine for hatsumode! You can buy snacks at the stalls and try your luck with the fortune slips, there is a lot more to the shrine visit than just the altar! Hatsumode makes for a nice start to a brand new year, so how about starting next year with a hatsumode?